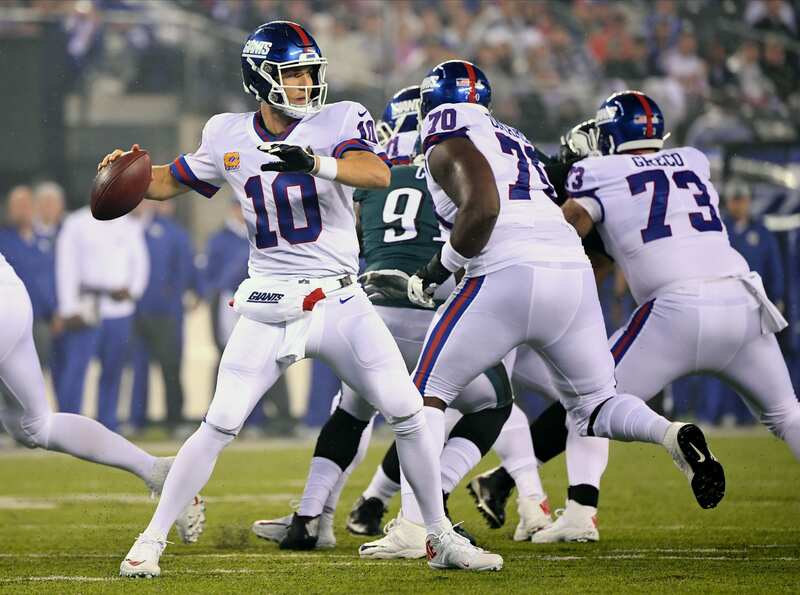 The New York Giants need a change after a troublesome start to their season, currently sitting at 1-5 on the year. Several close games and last second field goals have put Big Blue in a position to miss the playoffs and barely contend in the lowly NFC East. The devastating loss to the Philadelphia Eagles in week 6 saw a lack of effort, coaching, and much more. The offensive line was beaten badly, especially right guard Patrick Omameh, who faced off against one of the league’s best defensive lineman in Fletcher Cox. How are the Giants changing up their offensive front against the Falcons? Ahead of Monday night’s matchup against the Falcons, the Giants will be making some essential changes to the line. Omameh will likely be pulled out of the starting lineup and Spencer Pulley will be inserted. This breakdown from Brian Baldinger only scrapes the surface of how poorly the Giants have performed on the offensive line this season, and a lot of the issues comes at the center and right guard position. I would prefer to see Pulley fill in at center, where he started in all 16 games for the Chargers last season, while Greco is moved to right guard. A ton of the issues on the line have come from a lack of communication and missed assignments. Greco has chosen the wrong player to block on several occasions, for example, he decided to help Will Hernandez on a double team instead of Omameh against Cox, the Eagles’ best interior d-lineman. The hopes will that Pulley, a natural center, will have a better understanding of his role and assignments throughout the game. The end goal is to give Eli Manning even a fraction of a second more time to allow his receivers to complete their routes. Head coach Pat Shurmur’s offense is very reliant on timing. How Did Aaron Judge Impact The New York Yankees in 2018? Finally, Someone gets what I’ve been talking about since the beginning of the season. Brian Baldinger has hit the nail right on the head. How can anyone expect Eli and the timing to work if he’s not given the time for the plays to develop? I sure hope that the coaching staff gets this figured out soon before the season is lost for good. If we lose another game or two, then we’re done for the year in my opinion anyway. I know that Pat Shurmur has a pretty good idea of how this offense will and should work and given enough time for the plays to develop they will work but only if Eli can get protection and he’s still going to have to overcome his fear and learn to trust the protection in front of him. So far this year, Eli has been beaten to death back there and he’s going to need time to trust his line again. Agreed… the offense is about timing and Eli doesn’t have any.